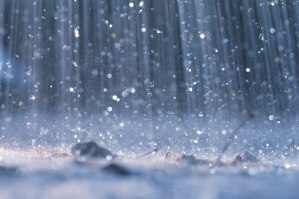 Monsun is the Swedish phrase for Monsoon in English, originating from German spelling, but the word comes from Arabic and Portugese, meaning seasons. 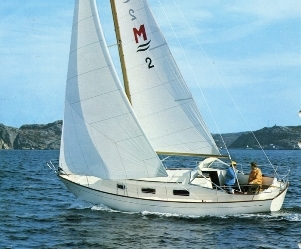 Monsoons may be considered as large-scale sea breezes. They occur due to seasonal heating and the resulting development of a thermal low over a large continental landmass, are stronger and more persistent (seasonal) than sea breezes. They are caused by the difference in rising or lowering of land temperature compared to that of nearby ocean. This differential warming happens because heat in the ocean is mixed vertically through a "mixed layer" that may be fifty meters deep, through the action of wind and water turbulence, whereas the land surface conducts heat slowly, with the seasonal signal penetrating perhaps a meter or so into the ground. Additionally, the capacity of water to adsorb heat is significantly higher than that of most soil materials. Summertime, this has the consequence that the air over the land warms faster and reaches a higher temperature than the air over the ocean. The hot air over the land tends to rise, creating an area of low pressure. This creates a steady wind blowing toward the land, bringing the moist near-surface air from over the ocean with it. However, as the lifting occurs, the air cools due to expansion in the lower pressure, which in turn produces condensation and results in rainfall. 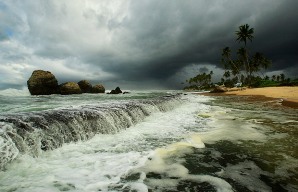 In winter, the land cools off quickly, but the ocean retains heat longer. The cold air over the land creates a high pressure area which produces a breeze from land to ocean. As the air moves out across the ocean surface it warms up and dries out, since warmer air can contain relatively more dampness than cold air. A schematic view of the monsoon winds for each season across the Indian Ocean. Most summer monsoons have a dominant westerly component and a strong tendency to ascend and produce copious amounts of rain. Their intensity and duration, however, are not uniform from year to year. Winter monsoons, by contrast, have a dominant easterly component and a strong tendency to diverge, subside and cause drought. 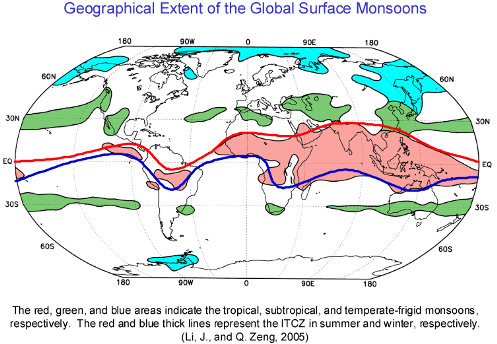 A map of the monsoon regions around the globe. As you can see they are most frequent and strong in the Indian Ocean and north of Australia.